It's almost that time of the year again... That's right time for Vaction Bible School! 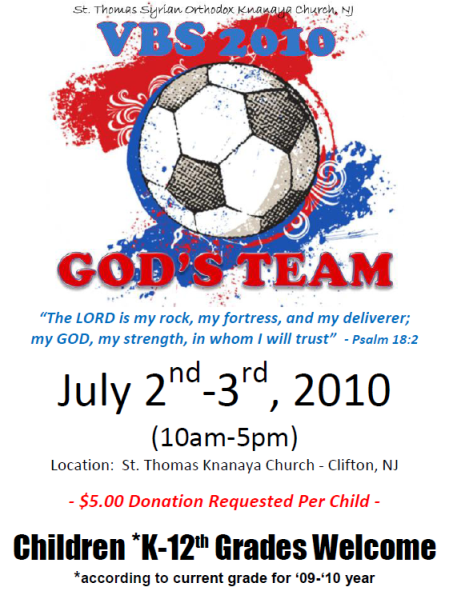 St. Thomas Knanya Church is proud to host another year of VBS! This year VBS will be taking place on July 2nd and 3rd. Registration is open now until May 31st. A link to the form is located below. Sign up now and come out and have fun this July! © 2008, St. Thomas Syrian Orthodox Knanaya Church, Inc.